If you or a family member has experienced a dangerous blood clot, you may have an underlying condition known as thrombophilia. Thrombophilia increases the risk for dangerous clots in your arms, legs and lungs. Some people are born with thrombophilia (inherited thrombophilia), while other people develop thrombophilia later in life (acquired thrombophilia). In either case, the condition has many forms and may affect people in different ways. This resource provides a thorough overview of thrombophilia and its many forms, discusses the risks and potential complications, summarizes the current perspectives about testing and diagnosis, and provides an overview of potential treatment options and lifestyle adjustments that you and your physician may consider necessary. With this information, we also share the experiences and insights of people who have been diagnosed with thrombophilia, as well as medical and scientific professionals experienced in diagnosing and managing clotting disorders. Blood clotting is essential to survival. Without it, the body is unable to stop bleeding after injury, illness or surgery. Even a minor injury or wound could progress to a medical emergency if clotting is inadequate.Normal clotting occurs in a series of reactions that work together to contain blood leaking out of damaged veins and arteries. When an injury happens, the body releases chemicals that constrict ruptured blood vessels, limiting blood flow to the area and reducing the size of the tears in vessel walls. The blood that has already spilled into the surrounding tissue forms a pool – called a hematoma – that presses against the vessels to further contain bleeding. These mechanical effects supplement the process by which the body manufactures its own clot to seal and begins healing the injury site. When an injury happens, the body mobilizes cells called platelets that rush to the injury site and perform their valuable clotting function. Platelets stick to the vessel walls and to each other, forming a plug that seals the bleeding site and helps start the healing process. This complex process involves dozens of factors, proteins and enzymes. Defects in the production or performance of any of these substances can lead to clotting problems that will be discussed in subsequent sections. Although blood clotting is instrumental to survival and overall health, abnormal clotting can lead to serious medical problems. One of the most common clotting disorders is the formation of a harmful clot that blocks blood flow within a blood vessel, most usually a large vein in an arm or leg, known as a deep-vein thrombosis (DVT). If a DVT breaks away from its primary site and moves to the lung, it is known as a pulmonary embolism (PE). These are life-threatening and result in up to 100,000 deaths annually in the United States.If you experience the signs and symptoms of a blood clot in your leg or arm, you should contact your doctor as soon as possible. If you have the signs of a PE, which can be life-threatening, you should seek immediate medical attention. For a comprehensive list of VTE risk factors, click this link to the National Blood Clot Alliance website: https://www.stoptheclot.org/know-your-risk. Sometimes, people experience blood clots for no apparent reason. These individuals may have a hidden risk for blood clots called thrombophilia. A thrombophilia can also be a risk factor that is present in addition to the ones listed above. This Web resource was produced specifically to help people with thrombophilia understand their condition, assess their risks in partnership with their doctor and take action to protect themselves when necessary. The subsequent sections will provide an overview of thrombophilia, the condition’s various sub-types, and the options for proper diagnosis and preventive treatment. An individual who has a family history of clots may have inherited a thrombophilia. According to the Centers for Disease Control and Prevention, approximately 5 to 8 percent of the U.S. population has one of several genetic risk factors associated with inherited thrombophilias, in which a genetic defect can be identified that increases the risk for thrombosis. Thrombophilia type. The various forms of thrombophilia are defined by the specific clotting protein the body produces irregularly. Some thrombophilias are more inherently dangerous than others. For example, thrombophilia characterized by hereditary antithrombin (HAT) deficiency is highly correlated with multiple blood clot episodes. More common forms, such as factor V Leiden and Prothrombin G20210A (discussed in detail in the next section) increase the chance of a primary blood clot several-fold, but in the absence of other risk factors, the overall incidence of VTE with these two types of thrombophilias remains low. Degree of abnormality, as measured by the number of defective genes inherited. You receive two copies of every gene, one from each parent. Heterozygous. If only one thrombophilia-related gene in the pair is defective, your thrombophilia is considered heterozygous, and your body will produce 50 percent abnormal protein. Homozygous. If both parents have the same mutation, you could inherit two defective genes. In this case, your thrombophilia is homozygous. As a result, your body will produce 100 percent abnormal protein. Other VTE risk factors. 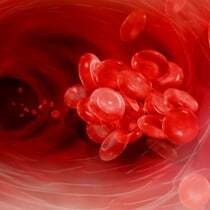 When thrombophilias are present in combination with other known blood clot risks, particularly hospitalization, surgery, pregnancy, cancer, or use of estrogen-based medications, the odds of a blood clot are greatly magnified. For example, some thrombophilias raise VTE risks 5 to 7 times the normal rate seen in the general population.13 Likewise, use of estrogen-containing oral contraceptives increase blood clot risks four-fold. But women with thrombophilia who use these OCs may face a 2- to 20-fold higher risk of an initial blood clot than women who do not use OCs.1415 The risk of a blood clot can also be magnified by obesity. Most thrombophilias are characterized by the lack of adequate amounts of properly functioning clotting proteins. These conditions are either inherited genetically from one or both parents, or acquired as the result of injury, illness or surgery. Often, thrombophilias are inherited from one or both parents. Certain genetic mutations correspond with specific thrombophilias. Some mutations, such as those underlying Factor V Leiden and Prothrombin G20210A, are relatively common, affecting 1-5 percent of the general population. Others, such as those responsible for protein C and protein S deficiencies, are less common, affecting fewer than one percent of people. Some thrombophilias are seen mostly in specific population subgroups or are very rare, posing little risk to the general public. 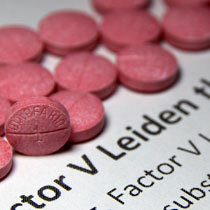 Factor V Leiden causes a genetic mutation that generates an abnormal version of factor V. As an instrumental clotting protein, factor V helps generate fibrin, the fibrous material that creates a “net’ to hold a blood clot together. Once a functional blood clot has been completed, factor V is inactivated by another substance called activated protein C – also known as APC. The altered version of factor V is resistant to APC, so its activity continues beyond its period of usefulness. As a result, factor V Leiden can cause an exaggerated clotting response. Hereditary Antithrombin Deficiency (HAD): Discovered in the 1950s, antithrombin is a protein that is necessary to prevent blood clots. People whose bodies don’t produce enough antithrombin are much more likely to develop a blood clot. HAD is less common than Factor V Leiden, affecting between 1 in 500 to 5000 people.18 This range suggests that approximately 63,000 to 630,000 people in the United States could be affected. However, it is the highest risk thrombophilia in terms of causing clots in the affected population. More than eight out of ten patients with HAD will have at least one clot by age 50. About six in ten people with HAD will have recurrent blood clots. The presence of HAD can be established with a blood test. You may be at risk for HAD if you have already had a clot, particularly if the clot did not have an obvious cause or if it was unusual in some way, or if you have a family member with a history of clots. Similar to protein C and protein S deficiency, HAD can be caused by genetic mutations that result in either inadequate production of antithrombin or production of dysfunctional antithrombin. Both types result in deficient antithrombin activity and an increased risk of blood clot formation. People with HAD are often treated by getting extra antithrombin to compensate for the antithrombin that is missing from the body. Treatment is more common in certain high-risk situations such as surgery, pregnancy and childbirth, or when the person already has a blood clot. Prothrombin G20210A: Discovered in 1996, Prothrombin G20210A is the second-most common thrombophilia, occurring in heterozygous form in 2 percent of the Caucasian population.21 Less than 1 in 10,000 have the homozygous form. As with factor V Leiden, Prothrombin G20210A is rare in people of non-European or Middle-Eastern descent. Its name includes the code designating the exact location of the mutation within the DNA molecule.Prothrombin G20210A features a mutation in the gene responsible for production of prothrombin – also known as factor II – a protein like factor V that plays a critical role in the generation of fibrin – again, the material that constitutes the structural meshwork in a blood clot. Individuals with the heterozygous disorder have too much circulating factor II, increasing the odds of VTE by 2 or 3 times the normal blood clot risk.22 Scientists have yet to quantify the risk for the homozygous form. Protein C deficiency: First described in the medical literature nearly 40 years ago, protein C deficiency is a relatively uncommon thrombophilia, occurring in less than half of 1 percent of the population or 1 in 200-300 people in its heterozygous form.23 However, when it does appear, homozygous protein C deficiency is considered a life-threatening illness.24 Unlike factor V- and prothrombin-based thrombophilias, protein C deficiency is correlated with an elevated risk of recurrent blood clots. As a result, it may require more concern in those who have already experienced an initial VTE event.Protein C is instrumental to shutting down the clotting process once repair of a damaged blood vessel is completed. Individuals with a protein C-related mutation produce either too little of the protein or a version that is inactive. Protein S deficiency: Named after the first letter in Seattle, the city in which it was discovered, protein S is known as a co-factor in coagulation. By itself, it cannot produce the chemical reactions necessary to regulate blood clotting. Instead, it enhances the activity of other proteins and enzymes that have direct impact on the process.Individuals with this condition lack enough functional protein S in their circulation. As with other thrombophilias, mutations can occur to one or both gene copies. The milder heterozygous deficiency affects less than a quarter of 1 percent of the population (1 in 500).25 The life-threatening homozygous form is extremely rare, but is usually the culprit in purpura fulminans, an often lethal and systemic clotting disorder in infants. Homocystinuria: An inherited disorder, homocystinuria is characterized by the body’s inability to metabolize certain amino acids – particularly homocysteine – that are the building blocks of proteins. This defect leads to chronic elevations of homocysteine that can injure the interior walls of blood vessels and trigger blood clots. Approximately 1 in 5 people born with hereditary homocystinuria will die from a blood clot-related complication before the age of 30.26 It is a very rare condition involving the transfer of abnormal copies of a gene known as CBS from both parents. APS is considered an autoimmune disease in which the body attacks its own cells, mistaking them for foreign invaders. The ensuing onslaught injures blood vessel walls, leading to exaggerated clotting responses. People with other underlying autoimmune diseases, such as lupus, or a history of particular infections are at higher risk of developing APS. The value of testing for thrombophilia is a matter of continued debate within the medical community and among families. To date, no validated testing guidelines have yet been published. Data showing the clinical usefulness of thrombophilia testing are limited, as are the benefits of preventive blood clot treatment based on thrombophilia diagnosis alone.28Individuals with a confirmed thrombophilia may need to take special precautions when facing surgery, planning a pregnancy, anticipating an extended period of immobilization or choosing a contraceptive method or menopause treatment. These and other VTE risk factors can be especially concerning in combination with a known thrombophilia. Sometimes, your doctor may prescribe short-term, preventive therapy until these risks are resolved. Experienced a blood clot at a young age (i.e., before the age of 50) that was unprovoked. Strong family history of VTE, including a number of close relatives who had a blood clot under age 50. Recurrent blood clots, especially at a young age. Severe or extensive VTE or blood clots in unusual sites. As with any medical decision, there are also concerns about testing, so screening for thrombophilia is an option that you and your healthcare provider should make together carefully. Should you decide to pursue testing, you should work together with your doctor and a genetic counselor. Together, they can help you understand your results and their implications. False positives and negatives are possible with these tests, although uncommon when the testing is conducted at the right time. 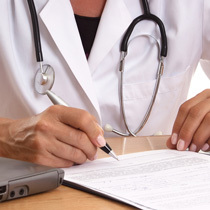 To minimize inaccuracies, your physician will avoid testing you if you have an active blood clot or are taking blood thinning medications, are pregnant or taking estrogen hormonal therapy as these conditions are known to influence test results. 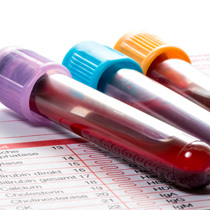 Likewise, certain illnesses, like kidney and liver disease, can also affect test results. Results typically don’t affect treatment decisionsIf you are already being treated for a blood clot, neither a positive nor negative thrombophilia testing result will likely alter your treatment plan. However, in the case of HAD, a prevention strategy is available since AT levels can be increased by the addition of AT factor. In the case of a confirmed thrombophilia diagnosis, your physician will continue your treatment with medications known as blood thinners. (See Section 7 for information about these medicines.) Of course, a negative thrombophilia test would be a relief. However, it’s critical that you don’t assume a false sense of security from the good news. You are still at risk based on your blood clot history. So, continue to take prescribed medication and follow all other medical instructions such a weight reduction as obesity is an important modifiable risk factor.If you are diagnosed with a thrombophilia and haven’t had a blood clot, it is unlikely that you will be given preventive treatment unless you have other significant risk factors. 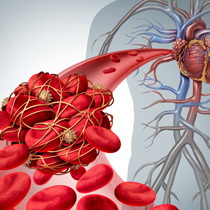 While all thrombophilias increase the risk for blood clots, overall risk remains low. For example, the general odds of experiencing a blood clot are approximately 1 to 2 per 1,000 people. If your thrombophilia increases this chance 5-fold, your risk is still only 1 percent or less. So, your doctor may not want to expose you to the potential side effects of blood thinners — including life-threatening bleeding — if your chance of a clot is low. 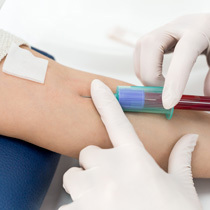 Sometimes people with extensive family histories test negative for thrombophilia. However, they remain at heightened risk for blood clots because VTE in close family members is a risk factor for a future blood clot. Yet, patients and/or their physicians may wrongly assume that negative test results minimize risk and may forego prudent preventive actions. Diagnosis can cause significant anxietyIf patients receive a diagnosis of thrombophilia in absence of other risk factors, it may cause them unnecessary anxiety even though the results may not change their overall risk profile. Unfortunately, many patients may worry excessively, lose sleep and have difficulty concentrating on work or family. In worst-case scenarios, some people pursue unnecessary treatment that exposes them to alternate risks.In most instances, a positive diagnosis is considered secondary to family history or personal experience with VTE. For most patients who have never had a blood clot, thrombophilia status is only considered relevant to prevention strategies when they face particular health events, such as surgery or pregnancy, that are established risk co-factors. Testing can be expensiveSome insurance plans won’t cover testing except under clearly defined circumstances that demonstrate medical necessity. Insurers are more likely to pay for tests if you have an abnormal blood clotting history, but not all do. Without coverage, testing – especially genetic screening – can be quite costly.Anyone considering thrombophilia screening should contact their insurance company to understand the criteria for coverage. Likewise, patients should know in advance their own financial obligations including co-pays, deductibles and out-of-pocket percentages.Although your doctor’s office and laboratory may handle much of the paperwork, make sure you are knowledgeable about the requirements. It is also important to seek the guidance of a genetics counselor when testing for thrombophilia. 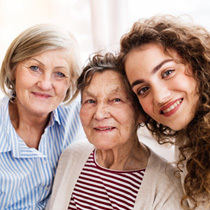 Genetic counseling services, or genetic counselors, can help families at risk for inherited conditions investigate the problem present in the family, interpret information about the disorder, analyze inheritance patterns, interpret risks to family members, review available management options, and help with insurance issues. For more information about genetic counseling, visit the following link: National Society of Genetic Counselors. For many thrombophilias, the first tests performed are assays to measure the amounts and activity levels of the various clotting proteins. For proteins that play an active role in clot formation, unusually high levels would suggest that the body is producing either too much or an abnormal version of the molecule. For proteins that inhibit the clotting process or dissolve clots once blood vessel repair is complete, inadequate levels would show that the body is having trouble generating adequate amounts or properly functioning forms of the molecule. These types of assays are available specifically for antithrombin and proteins C and S. If results strengthen suspicion of an underlying thrombophilia, screenings for genetic mutations may be warranted. For the most common thrombophilias, factor V Leiden and prothrombin G20210A, only genetic tests are available to identify the presence of characteristic mutations. The most common tests use technologies that multiply the DNA in a blood sample into millions of copies so that mutations can be easily identified. Antiphospholipid antibodies are strictly an acquired thrombophilia, so no genetic screenings are necessary. Instead, several assays are used to detect high levels of molecules associated with antiphospholipid disorders, including markers for the autoimmune disease Lupus and antibodies for the fatty acid cardiolipin. Blood clots are managed with anticoagulants, also known as blood thinners. Although these medications don’t actually thin the blood, they do slow down the clotting process by binding to various clotting proteins and neutralizing them or reducing the production of clotting proteins by the liver.29 This keeps existing clots from getting larger and stops the formation of new clots while the body works to dissolve the existing clot.If you experience a blood clot, you and your doctor will work together to select a suitable blood thinner and develop a treatment plan based on the location, extent and severity of the clot, your risk for bleeding and other considerations of your overall risk profile.30 The goal will be to maximize treatment benefits while minimizing adverse effects. 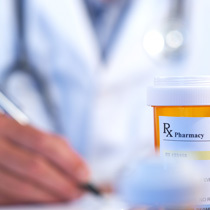 It is important that you take medication as directed, comply with all monitoring requirements, and report any potential complications immediately to your health professional. Sometimes blood thinners are prescribed strictly for primary clot prevention in people who have multiple risk factors, including a known thrombophilia, a strong family history of VTE, and a current health issue – such as pregnancy, hospitalization or impending surgery or prolonged immobilization – that are correlated with a higher incidence of clotting. Individuals with HAD may also receive additional antithrombin in high risk situations. Blood thinners are highly effective but may cause side effects, including moderate to severe bleeding. Some of these therapies require periodic monitoring to ensure that they’re working consistently. Unfractionated heparin (UFH) is a fast-acting anticoagulant that suppresses blood clot formation within minutes after administration. Due to its rapid onset of action, UFH is normally the emergency treatment of choice for blood clots. It is rarely used outside of a hospital setting because it is administered through an intravenous (IV) needle requiring placement by a trained medical professional. UFH therapy also demands frequent – usually at least daily – monitoring to ensure adequate blood levels. Initial dosing is based on the patient’s weight. UHF needs antithrombin to be effective, so people who have HAD may need to be treated with additional antithrombin in order to be successful with UHF therapy. Heparins don’t cross the placenta, so they are considered safe to use in pregnant women, although low-molecular weight heparin (see below) is considered the optimal formulation for various reasons. Before starting UFH treatment, you should alert your physician if you are taking a pain medication, such as aspirin, ibuprofen, naproxen or any other non-steroidal anti-inflammatory drug (NSAID) as these increase bleeding risks. 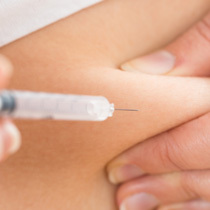 An alternative formulation of heparin, low-molecular weight heparin (LMWH) offers advantages similar to UFH, but with a few significant differences.LMWH is fractionated, a process that separates and collects the smallest molecular chains of heparin. These tiny strands act more predictably and last longer than UFH molecules. As a result, LMWH doesn’t require the frequent blood tests necessary with UFH. LMWH is usually administered via skin injection, making it more suitable than UFH for home use. Given its longer activity, however, LMWH can be more difficult than UFH to reverse should bleeding occur. Also, some patients may find home injections difficult to self-administer. From a cost perspective, LMWH is more expensive than UFH and may be an additional burden to patients without adequate insurance coverage. 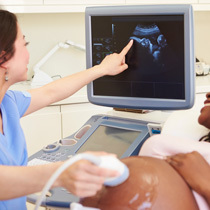 For pregnant women requiring heparin therapy, LMWH is the preferred heparin formulation. It is also often used in cancer patients in whom warfarin is less effective. LMWH is often used as a bridge therapy between UFH and an oral anticoagulant, such as warfarin (see below). LMWH needs antithrombin to be effective, so people who have HAD may need to be treated with additional antithrombin in order to be successful with LMWH therapy. Before starting LMWH treatment, you should alert your physician if you are taking a pain medication, such as aspirin, ibuprofen, naproxen or any other non-steroidal anti-inflammatory drug (NSAID) as these increase bleeding risks. People who require intermediate to long-term therapy with blood thinners are often prescribed warfarin (Coumadin®), an anticoagulant used successfully since the 1950s. Warfarin is taken orally, so it is highly suitable for home use and eliminates the need for painful and inconvenient injections or infusions. Its once-daily formulation improves patient compliance, a critical concern for outpatient blood clot management. Although warfarin can cause bleeding characteristic of all blood thinning drugs, its effects are easily reversed in the event of complications. Warfarin dosing is individualized and not based on weight. Therefore, it requires frequent monitoring by a test called the prothrombin time or PT. The PT measures the time it takes for blood to clot. The PT test is used to make sure the patient is taking the right dose of warfarin. The PT is reported by labs as an International Normalized Ratio or INR. For most patients, the ideal INR range is between 2.0 and 3.0. Readings lower than 2.0 increase the chances for clot formation and results above 3.0 elevate the risk for bleeding. Warfarin crosses the placenta and thins the blood of the fetus and therefore should not be taken by pregnant women except in very limited circumstances. Warfarin is the best blood thinner for patients with mechanical heart valves so women with heart valves should discuss their management with their cardiologist and obstetrician before becoming pregnant. Warfarin is not found normally in breast milk, so it is suitable for nursing moms. Many foods interact with warfarin, especially foods high in vitamin K, such as many green leafy vegetables. Alcohol can also affect warfarin levels, so patients who drink should consume no more than 1-2 daily servings. As with all anticoagulant therapy, NSAIDs such as aspirin and ibuprofen should be avoided when taking warfarin. Notify your doctor if you currently use any of these medications before beginning a warfarin regimen. The newest category of blood thinners, direct-acting oral anticoagulants (DOACs), offer a mix of short- and long-acting agents with good safety profiles and relatively low bleeding risks. The medications have been extensively studied and are considered to be at least as safe as conventional treatments.31 Members of this class of compounds include apixaban (Eliquis®), betrixaban (BevyxXa®), dabigatran (Pradaxa®), edoxaban (Savaysa®) and rivaroxaban (Xarelto®). There is limited information on DOACs during pregnancy but animal studies suggest they may cause adverse effects, so they should be avoided in pregnant women.34 Likewise, they should be used with caution in people with kidney or liver impairment. 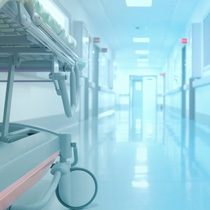 In addition, only one DOAC, dabigatran, has an antidote to quickly reverse its anticoagulant effects in case of serious bleeding or emergency surgery. As a result, most of these drugs are unsuitable for individuals at high risk of bleeding complications. Again, anyone prescribed DOACs should notify their physician if they are taking aspirin or other NSAIDs for pain relief as they increase bleeding risks. 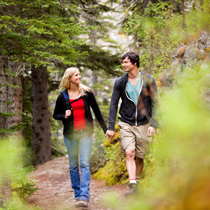 For people who have experienced a blood clot or have been told by a healthcare professional that they are at elevated risk for DVT or PE, various lifestyle adjustments can provide added protection.Overall, it is important to stay healthy and active. Drink plenty of fluids, preferably water, to avoid dehydration. Eat a balanced diet, incorporating a variety of nutritious foods that do not interfere with the effectiveness of any blood thinners you might be taking. 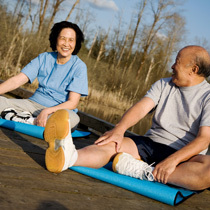 Choose exercises, sports and other activities that you enjoy and that are appropriate for your health status. Exercise keeps your blood moving and maintains good circulation. It also helps you to lose or maintain body weight and improves lung function. Periods of extended immobility, such as very long plane flights or extended intervals of sedentary behavior (e.g., sitting at your work desk or on the couch watching TV) are known to heighten the chances for a blood clot. When travelling, especially on overseas trips, try not to stay confined in your seat for the duration. When the “no seat belt” sign is lit, go into the aisle periodically to walk or stretch. If you must stay seated, avoid crossing your legs because this weakens circulation. Likewise, you can do foot and ankle exercises with minimal movement, such as rotating your ankles or pumping your feet. The latter involves putting your feet flat on the floor and alternately raising your toes and heels. These exercises can also be useful if you’re stuck at your work desk many hours each day. Likewise, it’s a good idea to set your cell phone alarm as a reminder to stand and walk down the hall every hour or two. If your schedule allows, go outside for lunchtime instead of ordering in food. If you’re a person with a demanding desk job or extensive travel requirements, talk to your physician about compression stockings that are designed to put gentle pressure on your legs and feet to improve blood flow. Quitting smoking is one of the best changes you can make for overall health and, particularly, for reducing blood clot risks. 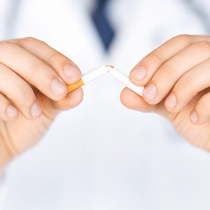 Smoking constricts blood vessels and, in combination with a fatty diet, increases plaque development on vessel walls. All of these physical effects make a blood clot more likely.If you are using blood thinners, make changes that reduce the likelihood of cuts and other injuries that could bleed excessively. First, avoid activities that increase these dangers, such as contact sports. If you ride a bicycle, ski or skate, make sure you wear customary safety equipment to protect from injury. In the home, switch to electric razors when shaving. Be extra careful when cutting nails and hair with clippers or scissors. Learn and practice safer methods for chopping and slicing food while cooking. Consider kitchen tools designed to reduce the need for cutlery, such as food processors and hand-held dicers with shielded blades. For oral care, use a soft- or extra-soft toothbrush and waxed floss to minimize gum bleeding. Talk to your healthcare provider about other sensible steps you can take to lower blood clot risks. Discuss any questions you might have with your healthcare team, and get additional information from a genetic counselor. 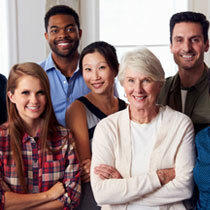 Click here to identify a genetic counselor in your local community.